You have to admire their cheek. Theresa May’s Conservative Government is leaking to the press a policy proposal from a review they commissioned which, if implemented as-is, is likely to prove catastrophic for universities in England, and in the rest of the UK by extension. They are proposing to reverse the headline Higher Education policy decision of their ConDem forbears — the £9,000 (now £9,250) a year home undergraduate student fee in England, first introduced in 2012. Raising fees from £6,500 to £9,000 was always socially regressive. It meant that poorer students would face a lifetime of student debt, whereas wealthy students could get a cheap loan for the duration of their study. The richest 10% avoid thousands of pounds in interest by paying upfront. Raising fees has put off a generation of mature students from re-entering education. The ‘heavy lifters of social mobility’, the post-92 universities, the Open University and Birkbeck College have been hardest hit by the Government policy changes. But back in 2011, the universities were also supported by additional Government funding (so-called ‘block grants’). These were partially abolished at precisely the same time as the £9,000 fee was introduced: 100% abolished in Arts and Humanities, reduced in STEM subjects and not cut in Medicine. The abolition of the block grant was not accidental. It was intimately tied to the market idea of the student as consumer, so if students chose to move college or subject, money would flow accordingly. But this also means that if the Government resurrected the block grant, it would undermine its market policy. Reducing the cost of education to students is a welcome move — like the staff union UCU, I believe in the principle that education should be free to all who can benefit — but the Government is floating the idea of cutting fees without replacing the additional financial support for the universities they cut in 2012. The detail of what is likely to be officially proposed seems to be being leaked to the press in order to gauge public reaction. It may change, as the proposals are ill-thought through, piecemeal and do little to address core issues of the tuition fee market. But if it is implemented as-is, this will be the most significant State intervention in Higher Education since 2011. This time the intervention will be extremely costly for the university sector. So far, public comment appears to be directed against the allegedly poor value for money some university degrees offer. The Government appears to hope that they can rely on public anger against greedy vice chancellors, student dissatisfaction, or that favourite of the tabloid press, the Mickey Mouse Degree. The Government is catching university senior managements on the hop. The policy of fees-and-loans was welcomed by self-serving senior management groups who stood to benefit from higher fees. Many universities expanded aggressively on the premise that the golden goose would lay its eggs for ever. In 2014, the Government removed the cap on student numbers. This step poured petrol on a market fire. It fuelled an extraordinary Klondike of speculative capital expansion, as universities borrowed billions (according to the Times newspaper, £10.8bn and counting) to build new buildings and campuses to provide space to teach all these new high-fee-paying students they expected to recruit. Universities competed with their neighbours in what was often a zero-sum game. Deflating this market at a time of Brexit risks the worst of all possible outcomes for universities. May and her advisors have betrayed their erstwhile friends in the University Vice-Chancellorate. If the Conservative Government implement their proposals unamended, they will derail many universities, whose only response will be to pass the cuts on to students and staff. the abolition of the requirement for universities to teach students to completion. Sir Michael Barber, the new director of the Office for Students ominously comments, ‘Universities are not too big to fail’. The obvious question is what happens to the students? In the USA, where the model of competing for-profit providers is dominant, there have been a series of high profile collapses, most famously including the Trump University fiasco. In 2015, the Corinthian Colleges group collapsed shutting out 16,000 students, with student debts and no degree. This is why the question of the obligation of teaching students to completion matters: it prevents students being caught up in university bankruptcies. Update 9 February. The Guardian reports that Reading University (with 15,000 students) is in crisis, having reported itself to the regulator over a £121m land sale deal to cover its operating costs. Most importantly of all, the Government does not intend to bring back limits on student recruitment they abolished in 2014. Introducing a three ‘Ds’ requirement to access student loans is not likely to dent overall student numbers. It makes a handy soundbite for ministers to imply that universities have lowered standards. But students with poor ‘A’ level results do go on to excel at university, precisely because a good university education values individual ability over rote-learning tested by exams. The proposal would tilt the playing fields even further towards wealthier students and schools that ‘teach to the test’ than now. The inescapable fact is that this crisis, like previous crises enveloping universities, is Made in Westminster. It is the Conservative Government that created the problem in the first place. Now they want university staff and students to pay for it. Brexit is merely an excuse that allows May to tinker with the market system to avoid condemning its architects: Cameron, Gove, Willets, et al. Andrew McGettigan and other serious commentators have long argued that the £9,000+ tuition fee and its associated system of student loans was financially unsustainable. Brexit is simply a convenient political excuse to bring the Treasury’s mounting student debt mountain under control. On the most recent projections, annual loan outlay is expected to hit £18 billion by 2020 for English HE. Repayments are only expected to rise to significant levels sometime after 2030 – they currently hover around £1.5bn annually and might reach £3bn by 2020. The Government covers the shortfall between annual outlay and annual repayments received by borrowing. Over the next parliament, close to £90bn will be added to the national balance sheet as a result of student loans. This is over and above the additional borrowing needed to finance each year’s ‘deficit’. Treasury estimates of the rate of likely rate of repayment of this growing student loan debt mountain vary. But reputable estimates put this ‘RAB’ figure at around 50%, i.e. half the student loan debt is expected to be written off. Far from being cheaper or more efficient, as we noted in the Alternative White Paper, student loan debt is a tax on students and on taxpayers in the future (including the same students as they become taxpayers in turn). It is in attempting to bring to heel this unsustainable student debt mountain, actively hidden by the Treasury, that lies behind Government pronouncements about the future funding of universities. Indeed, the Government proposal may not work in curbing the debt mountain. If reducing student fees to £6,500 leads to increased student applications, then it is entirely possible that the debt mountain will continue to expand. Around half of the student loans borrowed are supposed to cover living costs, not tuition. So this first cut is likely to lead to further interventions by the Government. Universities were already expecting a significant impact on their funding as a result of Britain leaving the EU. Brexit transfers future cohorts of non-UK EU students from ‘home’ student classification (eligible for the lower ‘home’ fee, eligible for student loans and – if resident in the UK for three years prior to university entrance – maintenance loans) to the higher unregulated ‘overseas’ status. What should supporters of HE do? 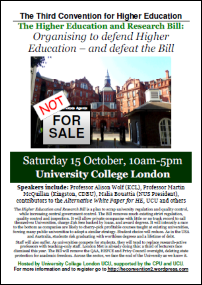 The Convention for Higher Education was set up to defend HE from the Willets reforms and in particular to campaign against the Higher Education and Research Bill 2016 (now Act). We brought together ex-Vice Chancellors with educationalists, trade unionists and student representatives. 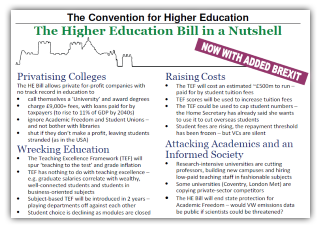 We put together a case against the HE Bill and we won some important concessions. We need to get organised. First, we have to assign responsibility for any crisis firmly where it belongs. Staff, their professional associations, and their trade unions must unite with students and their families, and everyone else who cares about the future of education. This crisis is not the fault of university staff. University staff did not support the raising of tuition fees. Staff joined with students on the marches in 2010 against the announcement of the £9,000 fee. Across the country, individual Academic Boards spoke out. The University and Colleges Union, the union of the teaching, academic-related and research staff in the universities, spoke out against tuition fees. UCU even opposed tuition fees when the National Union Students had conceded the principle if not the figure! Indeed, as the pages of this website shows, staff have been the principal victims of university restructuring and corporate bullying that market-driven ‘reforms’ have generated. At Coventry and London Met, staff and their trade unions challenged employers who attempted to worsen their conditions and make redundancies. There is a wave of redundancies building in Higher Education at the moment, and staff and their unions will have no choice but to resist. The beneficiaries of the HE ‘reforms’ were the university managements, building companies and capital hedge fund investors who saw an opportunity to make a killing out of the Great Expansion. And they were severely criticised and challenged by university staff. Thus, for example, when University College London senior management announced what it called its ‘2034 strategy’, it was roundly criticised by the local UCU branch for planning long term capital borrowing on the patently absurd assumption that the Government would support high-fee paying students indefinitely. The current Government has not suddenly discovered a taste for social mobility. Their reasoning is to exploit a Brexit crisis moment by pushing through other damaging policy shifts. As we have seen, the real reason for their statements is that the £9,000+ undergraduate fee and loans scheme is financially unsustainable. University managements have disgraced themselves and painted themselves into a corner. They look greedy, while student complaints (amplified by the NSS) go up. They are not in a good place politically to defend the £9,250 tuition fee. It would be possible to bring down tuition fees and replace lost income by direct funding to universities. This would mean closing the door to deregulated private providers (why should dodgy colleges be funded?). It would also make sense to bring back caps on student recruitment and regulate university borrowing. Reversing all of the Willets reforms — not just the fee level — is a necessary first step to bring down the cost of Higher Education without laying waste to the sector. A second step would be to plan to reduce the cost to students entering the sector to zero. The Labour Party’s proposal of a National Education Service, like the NHS for education, is extremely popular. University staff in the academic union UCU will shortly begin a national ballot for industrial action for pay and equality, and against casualisation. Last year, in the ‘old’ universities, staff struck in defence of their pensions. Staff can strike as well as march and demonstrate. They will be asking for student support. Higher Education is under threat. A new alliance of staff, students, their parents and anyone else who cares about the future of UK Higher Education is needed now. The Government’s position is also in marked contrast to public attitudes. The British Social Attitudes Survey (NatCen) has, before and since the introduction of tuition fee changes, regularly asked questions about public attitudes to higher education and inequality. The majority of the population has consistently opposed high levels of student debt, believed that education has a value beyond simply providing the means to a better job, and maintained that inequality in Britain is an obstacle to the fulfillment of opportunities. Perhaps surprisingly, this commitment to the values of publicly-funded higher education is especially marked among those without graduate-level qualifications. Politicians who argue that the latter resent paying taxes to finance education for ‘middle-class people’ should seek evidence for this assertion. But the ‘debate’ among politicians, members of the BIS secretariat and corporate lobbyists over the issue has been remarkable for its superficial, un-evidenced character. It has also been remarkable for the absence of full public debate (Leach 2016). Now is the time for everyone who cares about the future of Higher Education in the UK to defend it. As the NUS used to say, if you think education is expensive, try ignorance. The review is also likely to recommend maintaining the £9,250 currently paid to universities for each student, while reducing the proportion paid for through loans. It is considering ways to top up the difference by direct funding from government. This would ensure that universities received their current levels of funding per head while helping to cut the overall burden of debt incurred by students. The battle to defend universities is not won, but the Government is on the retreat. This entry was posted in alternative white paper and tagged alternative, bankruptcy, brexit, competition, Conservative Party, EU, Europe, higher education, Labour Party, NUS, Office for Students, research, students, tuition fees, UCU, university. Bookmark the permalink.